The following resources are available to help organizations and industry professionals develop their current skill set. Connect with them to find out how they can help you upskill your current workforce! This database and event calendar showcases over 30 local user groups aimed at supporting West Michigan's vibrant technology scene. There are many groups to get involved with! Django girls hosts free programming workshops for women to help attendees learn a new skill that can lead to a career in technology. Current IT professionals can get involved as a host, sponsor or volunteer. This nonprofit organization provides affordable, judgement-free opportunities for women interested in learning web and software development. Providing space for a workshop is a great way to get involved. coLearning connects small groups of peersto learn key skills in technology, design and entrepreneurship through mentorship and programs. The program provides skill development for individuals looking to get into IT or experienced industry professionals looking to hone their skills. This training provider offers coding bootcamps to prepare individuals for an entry-level development position. Training is available regardless of prior experience or an education in computer science and is great for those looking to change careers. This global IT training company provides training and certification preparation for a wide-variety of programs. The are an authorized training partner for many vendors including Microsoft, Cisco, Adobe, CompTIA and more. 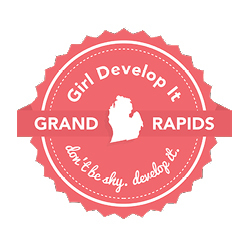 This nonprofit is dedicated to building and supporting the software design and development community in West Michigan. Their programs include: a speaker series, GLSEC Conference and Bitcamp. This organization addresses the need to bring local IT leaders together to share experience, expertise and knowledge. They provide monthly meetings, local conferences and networking opportunities.